Garnet group minerals, especially almandine, spessartine and grossular are found in abundance in many of the ancient rocks of New England and scattered fine specimens have been found over the years in many quarries. Only a few of the most interesting localities can be described in this brief essay. Because I was indirectly named after Russell Mountain in Russell, Massachusetts, I have always been intrigued by the mysteries surrounding garnets from there. 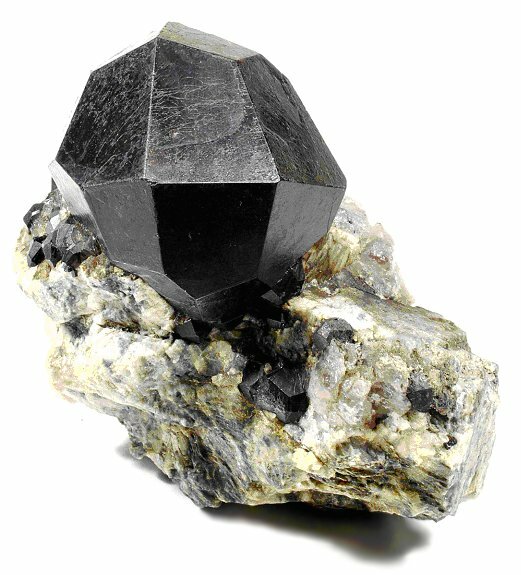 About 1885, Mr. Daniel Clark and Mr. F. S. Johnson worked a simple pegmatite which produced incredibly sharp well formed trapezohedral garnet crystals. The locality was given variously as Western Massachusetts, Tyringham, Westfield, and Russell. Reports said the crystals were found during the digging of a fire hydrant and single specimens were said to have brought the price of a “small cow.” Much of what was said at the time was either misinformation or disinformation. Still, specimens went to all the area museums, and Kunz reported that over $1000 was realized from the sale of these garnets. That was an amazing amount of money at the time. That the locality was not too clearly revealed is not surprising. Even the identification of the garnets was in doubt. I have seen them labeled alamandine, spessartine, melanite, and even grossular. One suspects they were given whatever identification the sellers thought the buyers might favor. In 1993, I was lucky enough to obtain the F. S. Johnson collection, and the garnets obtained have been determined to be almandine by Michigan Technological University. The garnet illustrated here was Johnson’s best specimen. The crystal itself measures 2 inches across, and it is probably the sharpest crystal and overall best specimen known from Russell. It is doubly amazing that it occurred embedded in the pegmatite. It was not a pocket crystal. Many people have looked for this old locality, although one suspects the discoverers would leave nothing of value. Such is probably the case but there may be other fine crystals yet to be unearthed in the general area. Terrance Szenics reports that he found the original workings in Russell, Hampton County. In 1971, he put in some blasts and found a few garnets. There are certainly other fine garnets in the pegmatites of the Connecticut River Valley, but none have quite matched the quality or romance seen in the specimens of this find made 120 years ago. The most colorful garnets in New England originated in the Belvidere Mountain Quarry near Lowell, Orleans County, in northern Vermont. These bright orange crystals rarely reach one inch across, but they have great luster, and they are among the finest grossulars from anywhere. Along with the garnets, nice vesuvianites, diopsides and chrome diopsides were found in the quarry. This sometimes made great green matrices for the orange garnets, and these were some of the most spectacular specimens. This mine was an asbestos quarry which closed a few years ago, a victim of the concern for all things asbestos. Collectors continued to work the quarry for specimens after its closing, and perhaps the most remarkable specimens from the quarry were found at this time. Single hefty, lustrous, foot-long epidote/clinozoisite crystals which rival the best in the world were found. Robert W. Whitmore of Weare, New Hampshire has one of the best of these. 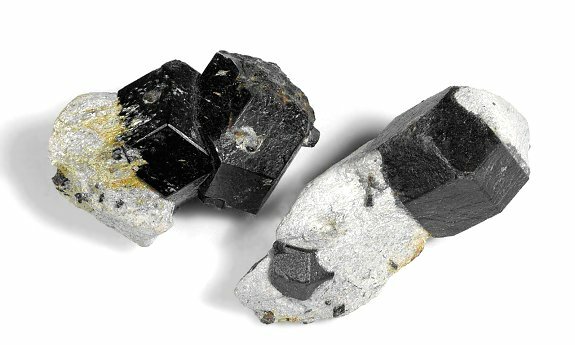 Garnets can still be collected in Connecticut at an old garnet abrasives mine generally called Green’s Farm or the Roxbury Garnet Mine (although it is slightly over the border into Southbury, New Haven County). Parking is next to the quarry, the fee is small and children are permitted. Dodecahedral almandine crystals, generally to one inch, can be collected from the relatively soft silvery schist. The best specimens tend to be in the harder schist, and display multiple garnets. Once in great while staurolite twins can be found in matrix next to the garnets and these are especially nice specimens. Specimens can be cleaned with air abrasive equipment. Two specimens with one inch crystals are shown below in order to illustrate what can still be found. Better specimens can be found with more determined digging.